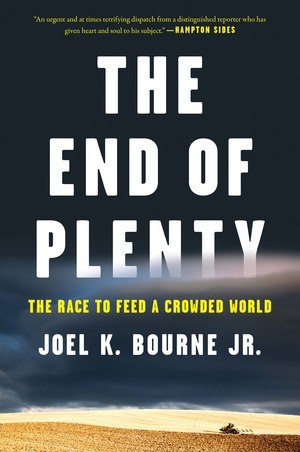 As Global Population Grows, Is The Earth Reaching The 'End Of Plenty'? NPR's Fresh Air interview with Joel K. Bourne, Jr. In The End of Plenty, award-winning environmental journalist Joel K. Bourne Jr. puts our fight against devastating world hunger in dramatic perspective. He travels the globe to introduce a new generation of farmers and scientists on the front lines of the next green revolution. He visits corporate farmers trying to restore Ukraine as Europe's breadbasket, a Canadian aquaculturist, the agronomist behind the world's largest organic sugarcane plantation, and many other extraordinary farmers, large and small, who are racing to stave off catastrophe as climate change disrupts food production worldwide. A Financial Times Best Book of the Year and a Finalist for the PEN / E. O. Wilson Literary Science Writing Award.